The Sunday Independent journalist believes there is a lot of “pantomime” involved in the sport. McGregor and Mendes during Saturday's interim title fight. PAUL KIMMAGE HAS questioned whether mixed martial arts (MMA) should be taken seriously by the mainstream media, calling it “barbaric”. The combat sport’s popularity in Ireland has grown considerably in recent years, with poster boy Conor McGregor becoming one of the country’s most talked about athletes during that time. 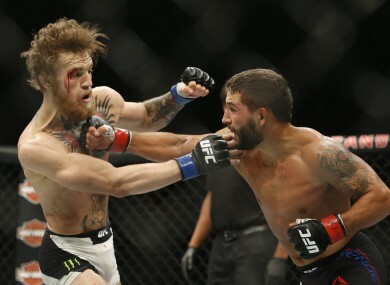 Over the weekend, thousands of Irish fans travelled to Las Vegas to watch the Dubliner win the UFC featherweight interim title by claiming victory over Chad Mendes thanks to a second round TKO. The UFC hosted a sold-out event in Dublin 12 months ago and it will return to the 3 Arena in October, while Croke Park has been touted as the venue for McGregor’s title defence next year if he can overcome Jose Aldo. The success of McGregor and a host of other Irish fighters has inevitably led to MMA, and, in particular its premier franchise the UFC, receiving far more coverage in the mainstream media. However, speaking on RTÉ Radio 1′s Today With Sean O’Rourke, well-respected sports journalist and former cyclist Kimmage says he is “repulsed” by the sport. I’m intrigued by it,” Kimmage said. “I’ve been asking about it now for a long time as whether we should engage with this because there is a lot of pantomime to it. Email “'I'm repulsed by it' - Kimmage questions credibility of MMA”. Feedback on “'I'm repulsed by it' - Kimmage questions credibility of MMA”.